Have all your kitchen tools together in one bag with the Gourmet Kitchen Set 11 from GSI Outdoors. This all-in-one 11 piece kitchen set has every utensil for any gourmet expedition. Have all your kitchen tools together in one bag with the Gourmet Kitchen Set 11 from GSI Outdoors . This all-in-one 11 piece kitchen set has every utensil for any gourmet expedition. All-in-one 11 piece kitchen set has every utensil for any gourmet expedition. Pivoting tools rotate from stored to working position. Waterproof shaker modules screw together to keep spices dry and flavorful. 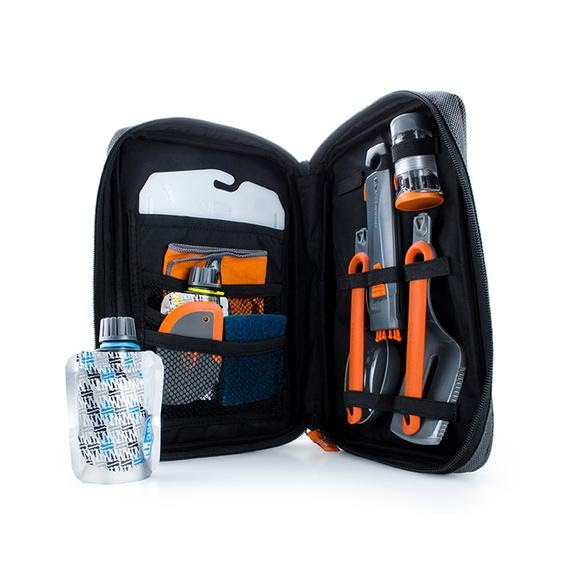 Attractive, ballistic nylon outer case keeps everything organized. Volume 11.50" x 7.50" x 2.00"